she can quilt: Triangle City - Ta Da! This is Triangle City - her name is courtesy of my friend Helen who blogs at Archie the Wonderdog, and isn't it a perfect name. Triangle City was made from 6 fat eights provided by Riley Blake Fabrics as a Modern Quilt Guild fabric challenge. I added Kona White on the front (it is white, the pictures were taken after much of the light had faded this winter's day) and Kona Charcoal on the back. The binding is Kona white. I entered this Modern Quilt Guild fabric challenge as an individual member, before my local EMQG joined the MQG. The challenge I set for myself was to make a useable baby size quilt. Triangle City is 41.5" by 41". The quilting is straightish lines about 0.5" apart with my usual industrial modern approach. You can see right at the top that I used that top blue gingham triangle as the start of the quilting lines and let them cross over at the top, and I filled them in under that triangle as well. These detail photos look so puffy as this is after two trips through the washer and dryer. Quilting a quilt this large with a triangle of quilting lines in the middle makes a quilt pucker and stretch a lot. So before I bound her I washed her to see what would happen to those puckers. The washing sorted out much of the puckers and so I trimmed her and added the binding by machine. Then the edges were all wavy due to the fact that quilt was washed and the binding was not, so back into the wash she went. The second wash sorted out all the wavy binding and made her so bumpy and soft. Triangle City might well be a quilt with two fronts. I love the back as much as the front, even the part where I did not line the back up straight and the improv part is at an angle. You can really see the quilting lines nicely in this photo, which is distorted due to the camera angle, as those edges are now nice and straight. I used the same creamy white Superior Threads King Tut thread on the front and the back of the quilt. I thought the white lines on the back would add detail and soften the dark charcoal colour a bit. I love the little improv bits on the back. You can also see the edge of the machine stitched binding - I do think hand stitched looks more even but machine stitched binding works well with my industrial modern theme and is far faster to complete. After all the matchstick quilting I have been doing lately, these lines seem miles apart. But I did resist the urge to add more quilting and the quilt is soft and puffy with this level of quilting. These last two photos are of Triangle City hanging up, not flat on the ground. You can see the quilting and the texture a bit better. I am totally smitten with this improv quilt, and I just want to make more. Looking at her, I am reminded that she is really also be part of a series of my quilts, I seem to enjoy exploring similar themes a lot. And Triangles. Notice the similar quilting, which did not distort the mini quilt nearly as much as it did Triangle City. Triangle City is my first finish off my Q1 FAL list (the list is here), yahoo for a finish finally. Triangle City is also my February finish for A Lovely Year of Finishes, my link up post from the beginning of the month is here. In other news, tomorrow there will be a giveaway here, sponsored by the Fat Quarter Shop, so come back to enter. 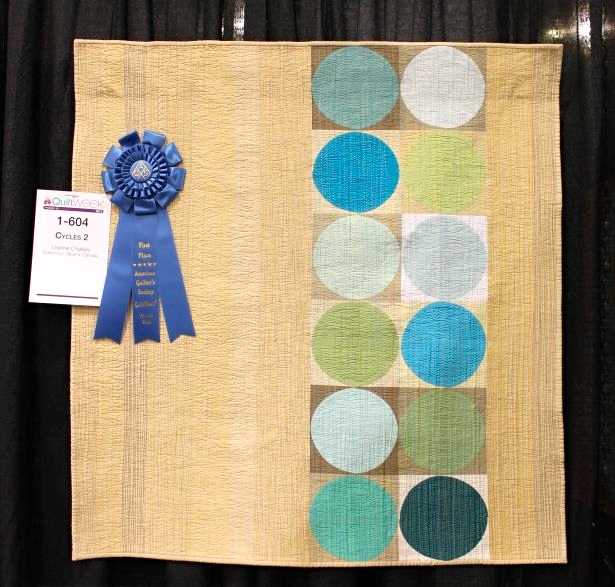 And Christa, from Christa Quilts sent me this lovely photo of Cycles 2 with her ribbon. Look at that gigantic ribbon, I'll be hanging it with pride in my sewing room. Christa is going to share her news of her visit to the America Quilters Society's Phoenix show, so check out her blog too. Tomorrow is the day for the big long arm delivery - part of the boxes were on a second truck that was stuck in bad American weather, so no delivery last Friday. Instead it is looking good to turn up Monday, on my actual birthday, which will delay assembly due to that pesky day job. Anyway, cross your fingers and your toes, I am really tired of waiting. What a very full post! I adore your Triangle City and her name too! Good job, Helen! I was kind of surprised at all your issues with the quilting, etc. though. Glad it all worked itself out - the texture is amazing! Yay RE: the long arm! HAPPY BIRTHDAY to you!! And super cool photo of your quilt! I see Christa's post is up - off to read it now! Love Triangle City - front and back! And congrats on the beautiful ribbon on Cycles 2 - something to be proud of! I hope your long arm is all you hope it will be! (do we nearly share the same birthday? Aquarians are great people!) I love this quilt, but no surprise there- I love everything you do! And 'industrial modern'! What a perfect name for this type of quilting! I'm so please for your win! And happy birthday - what a great birthday pressie. Happy Birthday, I hope you have a wonderful day. So sorry about the long arm delay.....waiting can be such a pain. I love triangle city and so wonderful to see pics of the Phoenix show. I like your improve style but I'm a bit surprised how much the quilt crinkled up. It makes the straight lines a bit disappearing. I like that it is actually double sided :-) Yay for the machine and Happy Bday! Happy birthday! Hope you have a great day and that the long arm arrives :) Loving all your work. Gorgeous triangles everywhere! And v excited about the long arm - look forward to seeing it all set up and quilting! Love your improv style! Congratulations on the Ribbon!! Triangle City is brilliant and yes, you do seem to be exploring themes in your quilts whether by design or accident. Very happy accident I may say. It is Monday here now so HUGE HAPPY BIRTHDAY!!!!! Enjoy your celebrations and be careful not to mug the delivery man in your excitement to get the longarm into your house! That is such an awesome quilt. I love the back and the quilting is, as usual, amazing. I especially like at the top where the quilting intersects...what a cool effect. Gorgeous make, Leanne! gorgeous quilt, actually both of them are amazing. Happy birthday Leanne! Triangle City is lovely, especially with your quilting. Loving the 'city' quilt so much, and you can't beat a big ribbon! Did you make up these patterns? Love the city. Your stitching is so lovely. You totally make me want to try harder with my machine quilting. :) Thanks for sharing! Your triangle design is just so great and the back is super fun too. I just can't get enough of straight line quilting!! I love all your work shown here. I wish you the best for the next creative and happy year!!! You did an awesome job with your Riley Black challenge! Did you know this quilt was blogged about on Quilt Inspiration (http://quiltinspiration.blogspot.com/2014/02/best-of-aqs-quilt-week-2014-part-2.html) in a post about the best of AQS Quilt Week?